Celeb Gossip News – Slovakia Dispatch: Andy Warhol Said He Came From ‘Nowhere.’ This Is It. Slovakia Dispatch: Andy Warhol Said He Came From ‘Nowhere.’ This Is It. MIKOVA, Slovakia — A Slovak cousin of Andy Warhol, the Pop Art icon, knew his American relative was a painter of some sort. He gathered that much from the letters his aunt, Warhol’s mother, sent to Mikova, the hamlet in the foothills of the Carpathian Mountains where both the artist’s parents lived before emigrating to the United States. “I thought he painted houses,” said Jan Zavacky, 73. Nobody in Mikova has made that mistake for a long time. 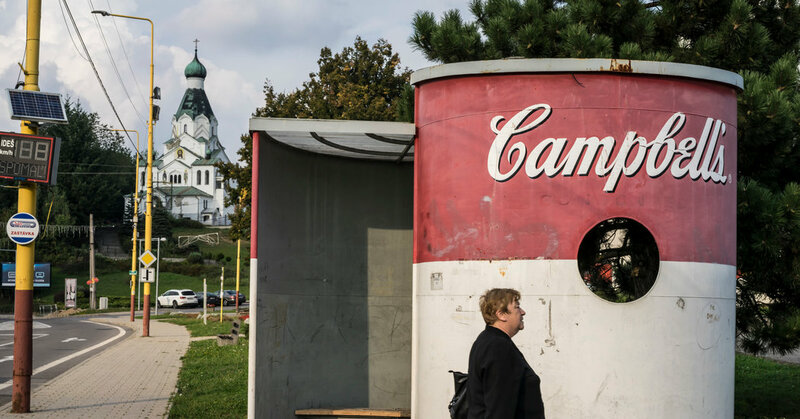 Since Warhol’s death in 1987, the tiny village in Slovakia has — more or less — embraced its role as a place of pilgrimage for his fans. They come seeking to understand how Warhol’s family origins may have played in his rise into a global art star who grabbed so much more than just 15 minutes of fame. The nearby town of Medzilaborce has turned a large Communist-era post office into the Andy Warhol Museum of Modern Art. The town’s main drag has been renamed Andy Warhol Street. On it stands the Andy Hostel. On the road to Mikova, a sign with Warhol in his trademark wig of wild hair proudly announces the village as his family home. After waves of emigration, few villagers remain — a cow herder, a few dozen pensioners and a cluster of Roma families. But all know the story of how the American-born son of Andrej Varchola and Julia Zavacky-Varchola made it big in New York, after changing his surname to Warhol. Few of the 100 or so residents, though, think much of his art. On the edge of Ms. Varcholova’s property in Mikova, which she left years ago to move to the city but still visits regularly, stands an old stone well, the only remaining structure from when Warhol’s father lived on that piece of land. Warhol enthusiasts from the United States and across Europe have come to admire it, she said. A dozen documentary films in multiple languages feature the village, which is so far from the beaten track that it may clarify what the often-cryptic Warhol meant when he said, “I come from nowhere.” Mikova doesn’t even have a cafe or bar, usually an indispensable feature of the smallest Slovak villages. Yet such is Warhol’s renown in these parts that Frantisek Lakata, a 67-year-old retired teacher, made a second career as a Warhol impersonator — until he put on too much weight and could no longer plausibly pose as the skinny artist. Mr. Lakata can still do a passable imitation of Warhol’s voice and, despite his potbelly, still likes to put on his Warhol wig. He considers the artist a kindred spirit. “He was a bit of a weirdo,” Mr. Lakata said. For many years, Warhol’s perceived strangeness was a big handicap in how he was regarded in these tradition-bound lands. Michal Bycko, an art expert who set up the Medzilaborce museum with help from Warhol’s family in the United States, said he visited Mikova in the 1970s, and tried to spread the word that the son of Andrej and Julia had become world famous by painting pictures of Campbell’s Soup Cans and Marilyn Monroe. “They laughed in my face,” Mr. Bycko recalled, and were “outraged” when he showed them a picture of Warhol in a wild-haired wig. Slovakia was then still part of Czechoslovakia and in the grip of a Communist government that had no interest in celebrating an artist it regarded as a drug-addled degenerate whose art work celebrated consumerism. Opinions changed after Warhol’s death, which, Mr. Bycko said, set off an “avalanche of interest” from foreign art enthusiasts and also from relatives, who had previously shunned Warhol because of his reputation as a gay fixture of the underground art scene in New York. Hoping to cash in on Warhol’s fame, the village tried in the 1990s to set up its own museum to display pictures lent by Warhol’s brothers. But the effort collapsed, said Mr. Zavacky, the Warhol cousin, who was mayor at the time, when the pictures disappeared from a makeshift display hall. The Medzilaborce museum opened in 1991. It houses Europe’s largest collection of Warhol art and artifacts, including 10 Campbell’s Soup Can prints, various Marilyn Monroes, a snakeskin jacket worn by the artist and a pair of his glasses. Like Warhol, who moved from commercial art to the avant-garde to mainstream celebrity, his family’s village is not easy to pin down as belonging to a single culture or identity. When his father moved to the United States on the eve of World War I, Mikova was part of the Austro-Hungarian Empire. When his mother followed a few years later, it had become part of Czechoslovakia. That country split in two in 1993. All along, Mikova has had its own off-kilter identity as part of Ruthenia, a nation that existed as a political entity for just one day in 1939, but that survived for centuries as a separate culture and language in the borderlands between Slovakia, Ukraine and Poland. Warhol’s parents both spoke Ruthenian, and the artist understood it enough to use it in 1980, when he met Pope John Paul II, who knew the language from his upbringing in southern Poland. Warhol’s first exposure to art was on childhood visits to churches attended by fellow Ruthenians in Pittsburgh, which were decorated with brightly colored icons. The church in Mikova where Warhol’s parents married is still standing, painted a fluorescent yellow that makes it look like a Pop Art hallucination in the otherwise drab village. Samuel Macko, 15, who lives in a ramshackle Roma settlement on the village’s edge, said he particularly liked Warhol’s incandescent pictures of Marilyn Monroe. “I think Andy would be pretty shocked if he had ever seen where he came from,” Samuel said. Unlike his two older brothers, Warhol never visited his family’s home village. The closest he got was Vienna. The museum founder, Mr. Bycko, said Warhol was in no way leery of his roots and referred to himself as coming from “nowhere” simply because the country his parents left no longer existed. “Andy never denied his origins,” he said. Ms. Varcholova, the other cousin, said it was “insulting” that Warhol had gone to Vienna but not bothered to visit his family. “Maybe he was ashamed,” she said.